A team from the Discovery Centres recently spent nine Wednesday afternoons together with nine awesome tamariki (children) in a trial run of Te Papa’s first after school club. 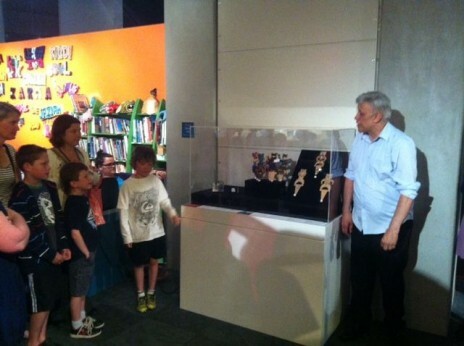 Through the after school club we wanted to learn, together with the tamariki, about the stories Te Papa tells. We also wanted to find out how everyone can connect to Te Papa’s collections and use them to tell our own stories. External speakers came in to talk to the after school club about all sorts of topics, from Samoan sasa to stick insects. The first week saw Alistair from Wellington Photographic Supplies show us how to make the whole classroom into a big camera obscura. 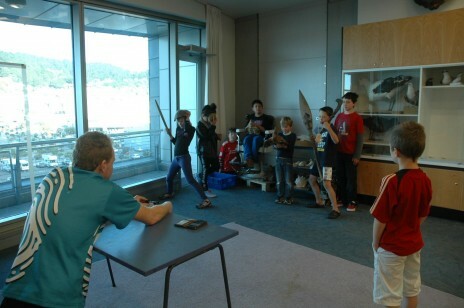 The tamariki built their own pinhole cameras and took photos of objects and scenery around Te Papa. After School Club posing for the pinhole camera. Photo: Kimberley Gustavsson. © Te Papa. Another week we discovered karetao (traditional Māori puppets) with Ati from the Discovery Centres, and got to build our own contemporary ones with the help of Rich from Ponoko. 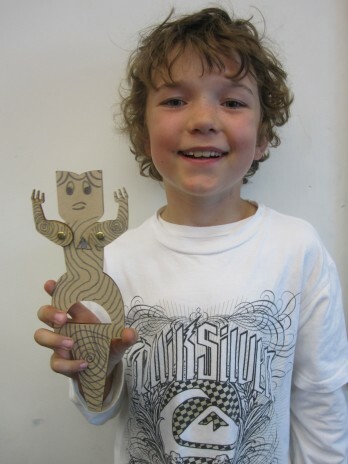 The tamariki created characters and environments for the karetao, designed them and wrote their mihi (greetings). Karson and his karetao. Photo: Kimberley Gustavsson. © Te Papa. After karatao came a field trip! Ricardo Palma, an entomologist, took us on a special tour of the Tory Street building, where Te Papa’s zoological specimens are kept. The tamariki got to choose which insects to learn about: weta, stick insects and beetles were high on the list. From insects to dancing in just one week: Crystal from the Discovery Centres showed us how to dance the Samoan sasa with style. We interpreted the sasa to tell the stories of people who travelled to New Zealand from the PacificIslands, learning NZ history and dancing skills at the same time! With all that hard work, the tamariki deserved a reward – and they got one! At the end of the after school club, the tamariki curated their own exhibition, showing the karetao and pinhole cameras to the public. Frith and Helen from Te Papa’s writing team talked to us about how to write labels for exhibition objects and the tamariki wrote one for their karetao. The exhibition now sits proudly in Inspiration Station, on Level 4. It was great to have the tamariki and their whānau (family) join us for the opening of the exhibition, complete with a blessing and delicious kai (food). Rangimoana Taylor blessing the After School Club’s exhibition Photo: Kimberley Gustavsson. © Te Papa. This is the first after school club exhibition at Te Papa and we’re really proud of all the tamariki who have taken part. They did a fantastic job on the exhibition, so please check it out. You’ll see some unusual karetao – from a free-running ninja to a sky spirit! Thanks to everyone who helped to make the after school club so special.